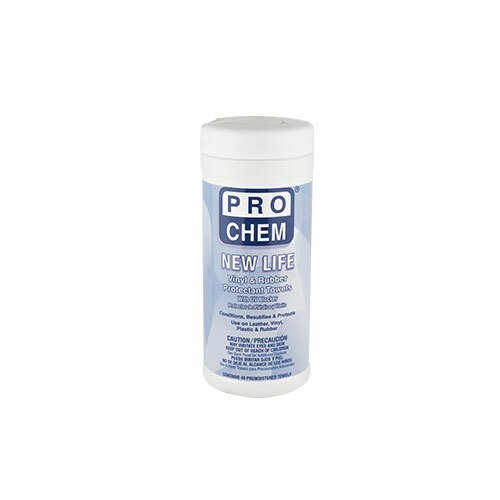 NEW LIFE | Pro Chem, Inc.
NEW LIFE wipes condition, beautify and protect vinyl, rubber, leather and plastic. Premoistened with an advanced water-based silicone formula, they clean and restore the surface’s original shine quickly and safely. Contains UV protection to keep automobile surfaces, both inside and outside, from drying, cracking and fading from sun exposure. An antistatic ingredient repels dust and keeps surfaces looking new long after they’ve been cleaned. Wipe down all surfaces and allow to dry to the touch. Discard the towel after use. Remove lid by lifting upward. Pull towel from center of the roll and thread through “X” on the underside of the lid. Close lid. Pull towel at a 90° angle. Snap hinged cap back into place to ensure towels stay moist. NOTE: Do not use on steering wheel, pedals and other instrumentation where slipperiness may present a hazard.